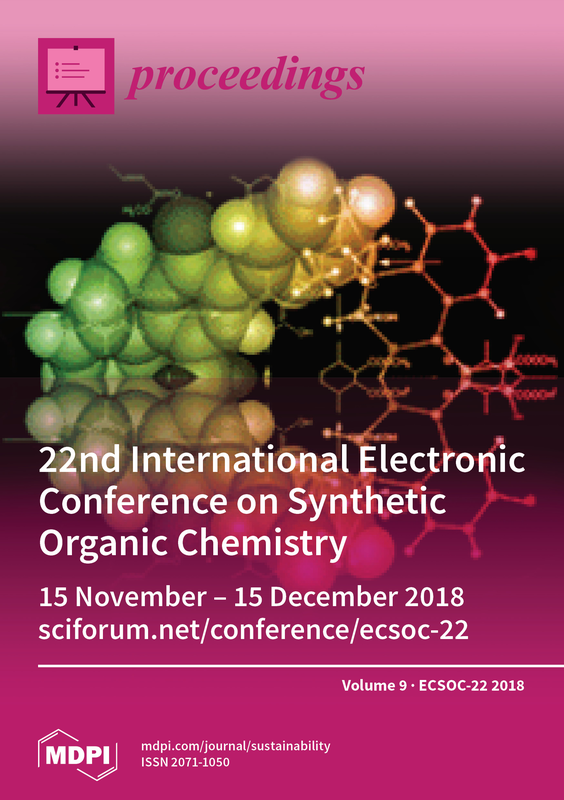 Cover Story (view full-size image) The Electronic Conferences on Synthetic Organic Chemistry (ECSOC) are a series of conferences that [...] Read more. The Electronic Conferences on Synthetic Organic Chemistry (ECSOC) are a series of conferences that have been held online since 1997. Originally, it was an initiative of MDPI, and was later amalgamated with the University of Santiago de Compostela (Spain). It now constitutes the longest running electronic conference in the world. It maintains free participation and registration in the true spirit of open access on the World Wide Web. ECSOC-22 covers a wide range of aspects involved in synthetic organic chemistry. The reduction of functionalized imines to yield amines is often an intricate task, since most of the methods described in the literature to reduce imines to amines do not take into account that many reducing agents have also basic character. In this way, [...] Read more. This work reports ultrasound assisted synthesis diethyl (2-(1-(morpholinomethyl)-2-oxoindolin-3-ylidene)hydrazinyl) (substituted phenyl/heteryl) methylphosphonate 9(a–j) derivatives. The derivatives are synthesized using a green protocol. In the first step, 3-hydrazonoindolin-2-one is synthesized using ultrasound. In the second step, diethyl (substituted phenyl/heteryl)(2-(2-oxoindolin-3-ylidene)hydrazinyl) methylphosphonate 6(a–j) [...] Read more. New push-pull second harmonic generation (SHG) chromophores 2 were synthesized in order to study their linear and nonlinear optical properties. The donor-acceptor π-conjugated systems 2 were prepared in good to excellent yields by a simple aldol-type condensation of the precursor aldehydes 1 with [...] Read more. An efficient Microwave (MW)-assisted synthesis of eight new 6-nitrilmethyl-pyrrolo[3,4-b]pyridin-5-ones via a domino process: aza Diels–Alder/N-acylation/aromatization (dehydration–decarboxylation) from their corresponding 2-aminonitrile-oxazoles and maleic anhydride are described. The use of MW as a heat source and scandium (III) triflate as a [...] Read more. In continuation of our recent research on the development of novel multicomponent reactions with isocyanides, we have used, for the first time, enols as the acid components in Ugi- and Passerini-type reactions. Thus, electron-poor pyrrolidinodiones react with aldehydes, amines, and isocyanides to give [...] Read more. : Ionic liquids are considered as a potential green replacement for traditional volatile organic solvents, but their impact on the environment is not sufficiently studied. The effect of the addition of aqueous solutions of different amounts (from 0% to 75%) of three ionic [...] Read more. Three 3-difluoroborodipyrromethene (BODIPY) derivatives functionalized at the meso and 2 positions were synthesized with 22–59% yield. The compounds were characterized by the usual spectroscopic techniques and a photophysical study was also undertaken. The BODIPY derivatives presented absorption bands in the 494–512 nm range [...] Read more. An unnatural amino acid derivative, N-tert-butyloxycarbonyl asparagine benzyl ester bearing a benzothiazole unit at the side chain, was evaluated as a fluorimetric chemosensor for several transition metal cations with environmental, biological and analytic relevance. Spectrofluorimetric titrations of the heterocyclic asparagine derivative with [...] Read more. Through reducing the system InCl3-Li-DTBB(cat.) in THF at room temperature and in the absence of any additives or anti-caking ligand, we have synthesized indium nanoparticles (InNPs) of about 4 nm. The catalyst was employed in the allylation of carbonyl compounds, giving [...] Read more. A general stereoselective approach to previously unknown 1,2,4-triazepane-3-thiones/ones based on reduction or reductive alkylation of readily available 2,4,5,6-tetrahydro-3H-1,2,4-triazepine- 3-thiones/ones has been developed. The approach involved treatment of tetrahydrotriazepines with sodium cyanoborohydride in MeOH at pH 3 or with sodium borohydride and excess of [...] Read more. A novel four-step methodology for the synthesis of 5-acyl- and 5-arylsulfonyl-1,2-dihydropyrimidin-2-ones has been developed. The reaction of readily available N-[(1-acetoxy-2,2,2-trichloro)ethyl]-ureas with Na-enolates of 1,3-diketones, β-oxoesters, or α-arylsulfonylketones followed by heterocyclization–dehydration of the oxoalkylureas formed gave 5-acyl- or 5-arylsulfonyl-4-trichloromethyl-1,2,3,4-tetrahydropyrimidin-2-ones. The latter, in the [...] Read more. In this study, a small organic compound containing cyano and N,N-dimethyl aniline as acceptor and donor groups, respectively linked through the conjugate system, were synthesized. Then, its structure was confirmed by FT-IR spectroscopy. Next, in order to investigate the photovoltaic properties [...] Read more. In this study, halloysite nanotubes (HNTs) as a green and available nano-mineral were used. The hydroxyl groups of HNTs were increased by acid treatment. So, the efficiency of HNTs was improved. The catalyst application of acid treatment HNTs was investigated in the synthesis [...] Read more. This paper presents a Quantitative Structure-Activity Relationship (QSAR) study of a series of 24 dihydropyrrole-fused and phenylazo neonicotinoid derivatives, with insecticidal activity tested against Cowpea aphids (Aphis craccivora). In this regard, the conformational search ability of the OMEGA software was employed [...] Read more. Porcupine is a protein belonging to the O-acyltransferase family, involved in the catalyzing of palmitoylation of wingless-related integration (WNT) proteins. WNT signaling has significant roles in many physiological functions, e.g., hematopoiesis, homeostasis, neurogenesis, and apoptosis. Anomalous WNT signaling has been observed to be [...] Read more. Xanthones are a type of compound widely found in many natural products from plants, fungi, and lichens and are considered privileged structures. Frequently, xanthones occur in nature as dimers, which often exhibit singular and potent biological effects. Although diverse methods for the synthesis [...] Read more. In the present research, 5,5-dimethyl-4-phenyl-4,5-dihydro-3H-1,2,4-triazole-3-thione (1) was prepared by condensation from N-phenylhydrazinecarbothioamide, while 4-phenyl-5-(pyrazin-2-yl)-2,4-dihydro-3H-1,2,4-triazole-3-thione (2) and 2-((5-(pyridin-2-yl) -4H-1,2,4-triazol-3-yl)thio)acetic acid (3) was prepared by oxidative cyclization from 2-(amino(pyrazin-2-yl)methylene)-N-phenylhydrazine-1-carbothioamide and 2-(amino(pyridine-2-yl)methylene)hydrazine-1-carbothioamide, respectively. The three compounds have been well characterized [...] Read more. An efficient method is proposed for N-adamantylation of primary carboxamides and sulfonamides, ethyl carbamate, and 4-nitroaniline using the stoichiometric amount of 1-adamantanol in the presence of 5 mol% aluminum triflate in nitromethane. Similarities and differences between adamantylation of some azoles catalyzed by aluminum [...] Read more. A simple, rapid, precise and accurate High-Performance Thin Layer Chromatography (HPTLC) method was developed and validated for the estimation of Nintedanib, a novel tyrosine kinase inhibitor used in idiopathic pulmonary fibrosis, in bulk drug. Chromatography was carried out using silica gel 60 F [...] Read more. A simple method of obtaining 2-(1-adamantyl)furans using a smaller amount of catalyst, providing a higher yield of the target products, as well as the possibility of varying the substituents in the furan ring was developed. The result wasachieved by the adamantylation of furans [...] Read more. The reaction of cyanothioacetamide with diethyl ethoxymethylenemalonate in the presence of triethylamine in hot EtOH proceeds non-selectively and leads to the formation of a mixture of triethylammonium 1,5-diamino-2,4-dicyano-5-thioxopenta-1,3-diene-1-thiolate (minor) and triethylammonium 3-cyano-5-ethoxycarbonyl-6-oxo-1Н-pyridine-2-thiolate (major). Upon treatment with primary amines and 37% aqueous HCHO in [...] Read more. The reaction of 5-amino-3-(cyanomethyl)-1H-pyrazole-4-carbonitrile with 3-aryl-2,4-di (ethoxycarbonyl)-5-hydroxy-5-methylcyclohexanones in boiling acetic acid leads to the formation of new 4,5,6,7,8,9-hexahydropyrazolo[1,5-a]quinazolines. The mechanism is discussed. The structure of the products was confirmed by means of 1Н и 13С (DEPTQ) NMR, as well as 2D NMR (NOESY, [...] Read more. The present work aims to compare two possible pathways of a pre-reaction complex in the reaction of transfer of a hydrogen atom from ammonia to a nitro compound forming. Nitrobenzene, nitromethane, and HNO2 were used as nitro compounds. The proposed paths are: [...] Read more. Organic synthetic research laboratories generate a large amount of waste. Some of the waste is the silica gel used as the stationary phase in column chromatographic separations. Here, the authors discuss the possibility of recycling silica gel wastes thermally at 600 °C, at [...] Read more. Density (ρ), speed of sound (U), and the derived magnitudes of two diethylmethylammoniumionic liquids (ILs) against temperature have been studied in this work. The chosen ILs were diethylmethylammonium trifluoromethanesulfonate [C2C2C1N][OTf] and diethylmethylammonium methanesulfonate [C2C2 [...] Read more. Selective estrogen receptor modulators (SERMs) are a class of drugs that act on the estrogen receptor (ER). SERMs are used for treatment and reduction of risk of breast cancer. Herewith we had designed, synthesized, and evaluated chalcone-phenylpyran-2-one derivatives bearing a N,N [...] Read more. The synthesis and characterization of one symmetrical bis-1-substituted-1H-tetrazole (69%) via a Huisgen-type 1,3-dipolar cycloaddition, as well as, one symmetrical aza-linked bis-5-substituted-1H-tetrazole (57%) via a classic Huisgen 1,3-dipolar cycloaddition followed by a reductive aza-coupling under greener [...] Read more. A biphenyl-based copper complex was evaluated as electrocatalyst for the oxygen reduction reaction (orr), for a possible application as cathode material in fuel cells. To carry out this evaluation, the complex was supported on Vulcan carbon and deposited as a film [...] Read more. Four new α-β-unsaturated alkyl-ester chiral amines were synthesized in excellent yields (77–95%) via peptide couplings from their corresponding α-β-unsaturated alkyl-ester anilines and N-Boc protected chiral aminoacids. To our delight, these polyfunctionalized compounds are being used as starting reagents in Ugi-type three-component reactions [...] Read more. Nicotinic acetylcholine receptors (nAChR) are ligand-gated ion channels formed by the assembly of five subunits. Receptor activity could be subjected to both positive and negative modulation at allosteric sites by endogenous neurotransmitters as well as synthetic ligands such as steroids, bivalent cations, alcohols, [...] Read more. 4,4-Difluoro-4-bora-3a,4a-diaza-s-indacene (BODIPY) derivatives 1 and 2 were obtained with 16% and 33% yield by a two-step reaction: condensation of a pyrrole with the corresponding aldehyde followed by oxidation with 2,3-dichloro-5,6-dicyano-p-benzoquinone (DDQ) in the presence of boron trifluoride diethyl etherate (BF3 [...] Read more. Hydantoins and their sulfur containing analogues, thiohydantoins, are cyclic ureides that have attracted huge attention ever since their discovery. Most of them are biologically active compounds and several points of structural diversity have made them very synthetically attractive. Although substituents can be introduced [...] Read more. In the present work a byphenyl hydrazone/SiO2 composite was synthetized by a simple procedure. First, the mesoporous SiO2 and the byphenyl hydrazone ligand were prepared. To prepare the composite, the mesoporous silica and the ligand were dispersed in ethanol/water by a [...] Read more. The catalytic activity of six different carbons was tested in the solvent-free acetylation reaction of alcohols, phenols, and monosaccharides with acetic anhydride. Three commercial carbons—a basic activated carbon M (Merck KGaA), a moderately basic carbon gel X (Xerolutions S.L. ), and an activated carbon [...] Read more. A solvent-free and catalyst-free synthesis of fused bis-heterocycles containing imidazo[1,2-a]pyridine and tetrazolo[1,5-a]quinoline frameworks is reported via a one-pot process. This Groebke–Blackburn–Bienaymé reaction (GBBR)/SNAr/ring-chain azido tautomerization cascade proceeds under eco-friendly conditions. The tetrazolo[1,5-a]quinoline and imidazo[1,2-a]pyridine scaffolds [...] Read more. An efficient synthesis of alkyne-3-tetrazolyl-tetrazolo[1,5-a] quinolones via a one-pot isocyanide-based multicomponent reaction (IMCR) process: I-MCR Ugi-azide/SNAr/ring-chain azido tautomerization was performed under eco-friendly conditions. We report the one-pot synthesis of tris-heterocycles containing a tetrazolo[1,5-a] quinoline connected to a [...] Read more. A series of variously methoxylated and methylated N-aryl-1-hydroxynaphthalene-2-carboxanilides was prepared and characterized as potential anti-invasive agents. As it is known that lipophilicity significantly influences the biological activity of compounds, the hydro-lipophilic properties of these mono-, di- and tri-substituted 1-hydroxynaphthalene-2-carboxanilides are investigated in the [...] Read more. A novel byphenyl hydrazone ligand developed as a chemosensor for the detection of Cu2+ was studied using a theoretical analysis based on the density functional theory (DFT) and time-dependent DFT (TD-DFT). The geometries of the ligand (L) and the Cu2+-ligand [...] Read more. A series of six new 3-imidazo[1,2-a] pyridine furan bound type tris-heterocycles were synthesized by Ultrasound Irradiation (USI) assisted Groebke-Blackburn-Bienaymé reaction (GBBR), by employing ammonium chloride (10 mol%) as a catalyst in excellent yields (80–93%) under green conditions. This efficient and [...] Read more.